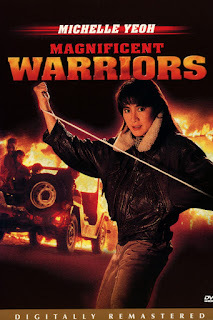 Magnificent Warriors is one of my favorite Michelle Yeoh movies and there is a great review by LuFengLover over at one of the Shaolin Chamber forum. One of her earlier films, the fights are sharp and on-point. And it also stars Derek Yee. You can find LuFengLover's review HERE. Kabuki Kaiser is an indie designer running a small OSR press, Kabuki Kaiser. For the last three years he has been teaching video game design in India and today he spoke with us about his new OSR adventure, FlowerLiches of the Dragonboat Festival. It is available now HERE. The book just came out today, just in time for Halloween. I have been taking a crack at it myself and it looks very cool. If you like wuxia, if you like Chinese Horror movies or ghost stories, definitely check it out. Brendan Davis: What is Flower Liches of the DragonboatFestival and what systems is it compatible with? Kabuki Kaiser: There’s this Dragonboat Festival, a race on the river, which takes place for a week in whatever city you play with. For a week, the race is under the control of powerful undead creatures—Flower Liches invoked from undeath to bring prosperity back to the city. It’s a setting encapsulated in time where the PCs can do whatever they want: investigate side quests, steal from the Flower Liches, fight them, participate in the race, etc. It’s like a sandbox setting, but a tightly contained one because it’s all just for a week. It’s roughly compatible with everything OSR, I mean it has an AC, HD, spells, magic items so if you play with an OSR ruleset, you’re good to go. As usual, I advise playing with either Labyrinth Lord, or Lamentations of the Flame Princess, but anything will do, really. BD: Why did you decide to make Flower Liches of theDragonboat Festival? KK: I saw a poster when I was in Vietnam. It said Tu Lich, and had flowers in it so I went wow Flower Liches! 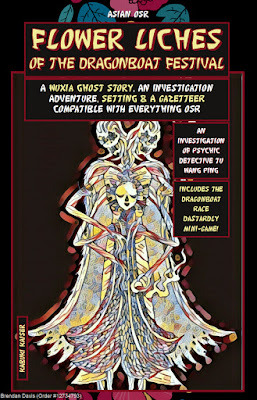 More seriously, I’ve read a lot about Chinese/Japanese Ghost Stories, travelled a lot in Asia, and wanted to bring that to the game table, this crazy fusion of gore, Wuxia, and high octane fantasy that you find in HK movies. I wanted to design something truly exotic, that would baffle your usual Oriental Adventures/L5R player, and yet, be true to the original Wuxia. BD: How would you describe your approach to design? KK: People are clever, that’s my motto. They don’t need to be told everything, they don’t need to be pushed in the right direction because that’s a roleplaying game, and there’s no such thing as a right direction in a roleplaying game. I want to be surprised, I want people to grab this book, and blow my mind. You can design with that kind of goal, set the triggers here and there, plant the seeds of chaos so that this will eventually happen. I don’t like to say things up front, to describe stuff at length, and all, I like to do it covertly so that you don’t see it when you read the book, but when you play it, BANG, the puzzle falls into place, and then we share our imaginations for a bit, it’s like magic. BD: Flower Liches of the Dragonboat Festival has an interesting look and structure, with many portions of the text color-coded depending on how people plan to use it; can you talk a little bit about the structure and why you took this approach? KK: Because it’s a place, at a certain time you know. It won’t change because you play halflings, or because you’re up to no good, it has its own life, and I wanted this place, and time to be interesting, and challenging for all kind of players, and all kind of characters. You can play 1st level characters just fine, and you can die a sorry death with 15th level characters too, trust me. But when you do this, you need a way to show the DM how to navigate it, to leave breadcrumbs, that’s why I use a few codes here and there. 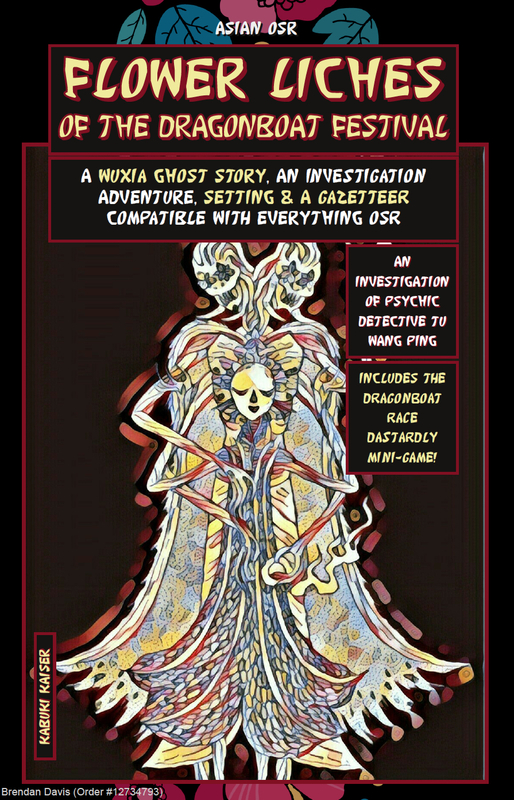 BD: While Flower Liches of the Dragonboat Festival can be run with a regular group, you wrote it so it can be played with a single player who takes on the role of Detective Tu Wang Ping in the manner of Judge Dee. Can you elaborate on this aspect of the adventure? How do you see people using this book? KK: That’s just a possibility I left to whoever buys it. If they want, they can play all this with just a friend, and a pre-generated character. There’s an investigation going on, it’s a more focused kind of play, but it’s also fun, and rewarding. You know, I’ve played for ages and ages, but sometimes there’s just me, and sometimes just my partner and me, so I had to devise my own means to get the play going: solos, now 1 vs. 1, this kind of things. BD: Can you talk about the art and graphic design of Flower Liches of the Dragonboat Festival? KK: I’ve tried to make it look like something you would find on a shelf in China some 20-30 years ago, I don’t know how well I succeeded, maybe it’s okay. Evlyn joined me pretty soon on this project, and made a lot of illustrations, and then, I don’t know why, we chose to use Prisma to make this really eerie, and psychedelic. When we realized that Prisma wasn’t okay with commercial use, I wrote them, and got their approval, and permission. So that’s basically a Russian software processing Canadian pictures for a book sold in the US, written by a Frenchman about Chinese Ghost Stories. BD: You describe it as a wuxia Ghost Story; for those who might not be familiar with the topic, can you explain what sort of things people can expect to see? KK: There’s a lot of innocence, an almost pulp-era level of innocence in Chinese/Wuxia Ghost Stories. Heroes are heroes, and they fight all kind of really, really gross demons. I mean, Flower Liches, how can we get more outrageous than that? Smell my orchid old death. I’ll spoil a bit here: they’re not just Flower Liches, they’re Kung-Fu Flower Liches. So there’s a lot of room for innocence, and goodwill, but also truly grotesque demons, and a lot of triple jump fireball fists of anger. BD: What were some of the influences that helped inspire Flower Liches of the Dragonboat Festival? KK: I’ve got a whole Appendix N there: A Chinese Ghost Story, all the books from Robert Van Gulik, the Detective Dee movies, Role Aids’ Lichlords of course because like in Flower Liches, you could play the one against the other, trick the liches, etc. Over at the Shaw Brothers Universe, I wrote about two Ti Lung movies made available on Amazon Prime this month. You can check it out HERE. I do these articles to promote Shaw Brothers and martial arts films, and don't get any money for them or for anyone viewing them. But as a matter of full disclosure, I want to mention that writing for the Shaw Brothers Universe website makes me occasionally eligible for complimentary merchandise. This is a log for my ongoing Disposable Disciples of Bone Kingdom campaign. You can see the previous session log HERE. Last session, the party contained the spirit of Shen Guan at the abandoned Crocodile Sect headquarters. Along the way they met a flower-giving man named Yang Shen. He came originally from Canyon Sect, an exterminated group that once held sway in The Valley. He joined the party hoping to reclaim The Valley from the current master. However news had reached him that things had changed for the worse in the region. No one had heard from Zhe Valley in two months. Messengers were sent, emissaries from powerful sects, but any who ventured there, either never came back or returned as a head in a box. Occasionally there was a note that simply said "Hua Yin". People came to believe a woman named Hua Yin had taken over Zhe Valley and closed it off to the world. Yang Shen, Min and Ong went south while Shen Chun took care of things at the sect headquarters. Along the way they stopped at Zun City, and Yang Shen met with the head of Zun City Protection Agency to arrange for 75 men to wait for him at Dee. Chief Zhu accepted an offer of 10,000 spades for the deal. They then went further south to The Valley. Upon their approach they passed through a region where they encountered a sack of silken web suspended from a tree. Ong attacked it with his chain and it burst to the ground, releasing ten hand-sized spiders that crawled at them aggressively. Min used her Hot Winds technique to destroy them. Eventually they encountered a man dressed the scholarly robes of a She Valley senior. He was flanked by five other men. He told them "you are not welcome here, leave at once." "Who are you?" Yang Shen asked. "I am Hua Min," he said then pointed at his disciples, "We are all Hua Yin." "So that is how this going to be," said Yang Shen, then leapt forward to attack. As the party encircled the group, Yang Shen lashed out with Sword Whipping Strike, felling the disciples and cutting the flesh of the scholar. The scholar then opened his mouth wide and a cluster of spiders poured out to attack the party. One of the spiders bit Ong in the stomach and began burrowing deep in his body. They managed to bring the scholar down and destroy the remaining spiders, then Yang Shen cut out the spider that was burrowing into Ong. Inspecting the men, they saw they all had spiders in their skulls, which appeared to have devoured their brains. Moving through the cobweb-covered hills they came to Ti Fan. Cutting a path through the webs, Ong and Min witnessed something crawling around the hill, trying to stalk the party. It was the size of a city block, with the body of a spider and the upper body of a great ogress. This was Hua Yin. "You should not be here," said Hua Yin. "Don't be a fool, let's talk this through, we can work out an arrangement. Clearly you have things under control here, we can work with you." "You can serve me," said Hua Yin. "No, we will negotiate an alliance but we will not be your servants," said Yang Shen. "You are not my equals, I have ruled the valley since the world was created, who are you to issue demands of me?" "I see there is no reasoning with you then," said Yang Shen. Ong Lao leapt and used stabbed Hua Yin through the eye with his blade. Green slime flowed from the wound. Yang Shen leapt onto her back and began stabbing viciously. Min used her stride ability to appear outside the the immediate area so she could get a wide range for her hot winds. Spiders begin to flow from the surrounding webs and converge on Ong and Yang Shen. Hua Yin reached back and delivered a devastating bite on Yang Shen, ripping out huge chucks of flesh. The battle went on for some time. Hua Yin's size and power was unlike anything they had encountered. When Yang Shen attempted to attack her by striking meridians and disrupting Qi flow, he felt only absence. There was no Qi. She had no meridians. But her power was immense. They coordinated their attacks, with Ong drawing her attention and evading her attempts to bite. With a final strike from a blaze of Blade of the Dancing Fox technique brought her down in a great heap.